Ramissio Immunity is a multivitamin syrup with orange flavor, containing beta-glucan and vitamin C, which with its composition contributes to the proper functioning of the immune system, protection of cells from oxidative stress, proper functioning of the psyche, reduction of exhaustion and fatigue, and normal energy metabolism. 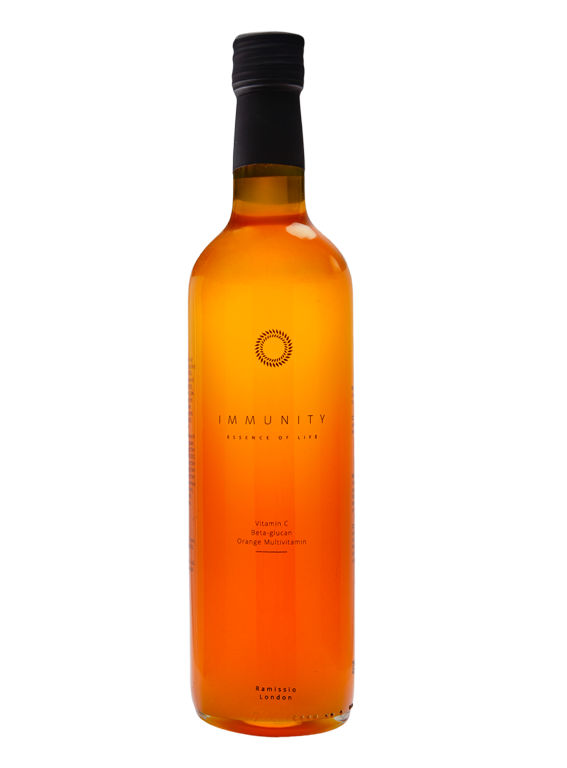 Ramissio Immunity contains up to 98% pure beta glucan, which surpasses other brands available in liquid form which are on the market. 1 bottle of Ramissio Immunity contains approx. 30 daily doses. It is therefore suitable for regular daily consumption in the home. Ingredients: Inverted glucose-fructose syrup, water, natural fruit flavors, citric acid (acidity regulator), beta-glucan (0,125g/10ml), vitamin C (L-ascorbic acid; 62,5mg/10ml ~ 78,1% DDD), niacin (nikotinamide; 0,5mg/10ml ~ 3,1% DDD), pantothenic acid (D-calcium pantothenate; 0,18mg/10ml ~ 3% DDD), vitamin B6 (pyridoxine hydrochloride; 0,04mg/10ml ~ 2,9% DDD), vitamin B1 (thiamine hydrochloride; 0,03mg/10ml ~ 2,7% DDD), folic acid (acid pteroylmonoglutamide; 6,25μg/10ml ~ 3,1% DDD), biotin (D-biotin; 1,56μg/10ml), vitamin B12 (cyanocobalamin; 0,01μg/10ml ~ 4% DDD). Contains no preservatives or chemical dyes.